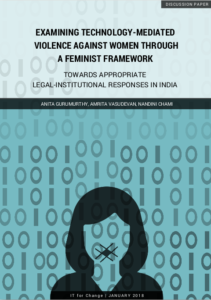 January, 2018: This discussion paper argues that the omnipresence of the digital demands a re-evaluation of legal-institutional response to violence against women. The networked logic of the Internet, and social media platforms that overrun it bank upon virality, effectively rendering ineffectual notions of ‘consent’. 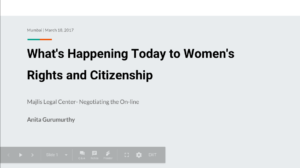 The paper attempts to posit a feminist response to the disruptions of the digital that builds upon jurisprudence of dignity, equality and privacy drawn from global and national legal frameworks. 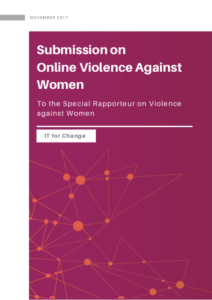 Finally, it recommends that rather than piece-meal alterations to the existing law, the paradigmatic shifts ushered in by the digital, justify investing in a new law for technology-mediated violence against women. Download full paper. 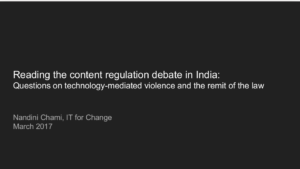 Technology-mediated violence against women in India. How can we strengthen existing legal-institutional response mechanisms? 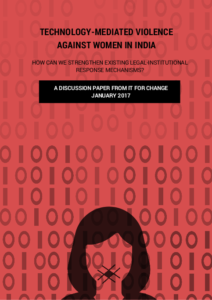 January, 2017: Our discussion paper on the issue of technology-mediated violence against women analyses the adequacy of the current legal and institutional frameworks in India and proposes alternate models that need to be debated and analysed. The paper raises a series of questions on overhauling the existing legal framework, effectively addressing intermediary liability and strengthening law enforcement and other institutional mechanisms. Download full paper. This paper was revised further in January 2018, please find the updated resource above. March 2017: IT for Change also had the opportunity to present its research under the project at Majlis Legal Centre’s annual conference ‘Negotiating Spaces’. The conference focussed on analysing various facets, impacts and internal contradictions of online spaces, through a gender lens.